Shop H&S Feed & Country Store in October and save with our horse feed savings. Now through the end of October 2018, save $1.50/bag off on Strategy & Strategy Healthy Edge horse feeds. Purina Strategy GX Professional Horse Feed is designed for all ages and lifestyles. Strategy GX Professional Formula horse feed is both simple and as complex. Simple, because the perfected-over-time formula provides 100% of the required protein, vitamins and minerals for a wide variety of horses in your barn when fed as directed. While there will always be individual horses with specialized nutrition and management needs, Strategy GX meets the nutritional needs of the vast majority of horses with a single formulation. So even when your horses are in different stages of breeding or development and varying levels of performance, Strategy GX delivers complex, balanced nutrition in a simplified feeding program. Complex, because over the past 12+ years, Purina Animal Nutrition Center researchers have fed Strategy GX almost 20,000 times in feeding trials and research studies to optimize palatability, growth, exercise performance, and manufacturing quality. The results and resulting optimizations make Strategy GX the unbeatable formula it is today. 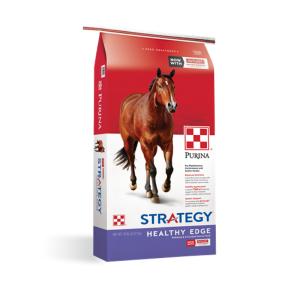 Purina Strategy Healthy Edge horse feed is best for maintenance, performance, and Senior Horses. Health inside and out. A nutritional edge. Two things every horse owner wants for their horse, and what Strategy Healthy Edge horse feed is designed to deliver. Nutrition that helps horses look amazing, feel great and perform at their best. Strategy Healthy Edge feed gives horses age 2 and older the nutritional edge needed to support nearly any lifestyle from recreation to performance to retirement. The combination of high-quality pellets and extruded Amplify high-fat nuggets delivers a controlled starch and sugar, higher fat and fiber formulation with moderate calories and balanced nutrition. Made with only high quality, wholesome ingredients and extensively tested at the Purina Animal Nutrition Center, Strategy Healthy Edge horse feed is easy for horses to digest and hard for them to resist. This entry was posted on Friday, October 5th, 2018 at 4:14 pm	and is filed under Events, News & Updates, Specials. You can follow any responses to this entry through the RSS 2.0 feed. Both comments and pings are currently closed.